Upon leaving the airport the heat immediately kicks in, it was hotter than Vietnam and just being outside made me feel like I wanted to stay 4 days in a pool to cool off. Unfortunately for me, I didn’t have many opportunities to do so. The hotel was located approximately 10 to 15 minutes away from all that is important for sightseeing, a pretty good location if you ask me. The first day I decided not to do any sightseeing yet, as it was already around 16.00 when I arrived at the hotel, I jumped in the pool to cool off, and enjoy the view, since the pool was situated on the 12th floor, giving me the opportunity to look towards the city that expands as far as the eye can see. In the evening a visit to Khao San Road was due, the warm weather made me crave for a cold beer and enjoyment to relax from a flight that was quite uncomfortable due to my size. I was lucky enough the seat next to me was empty that gave room for my legs. 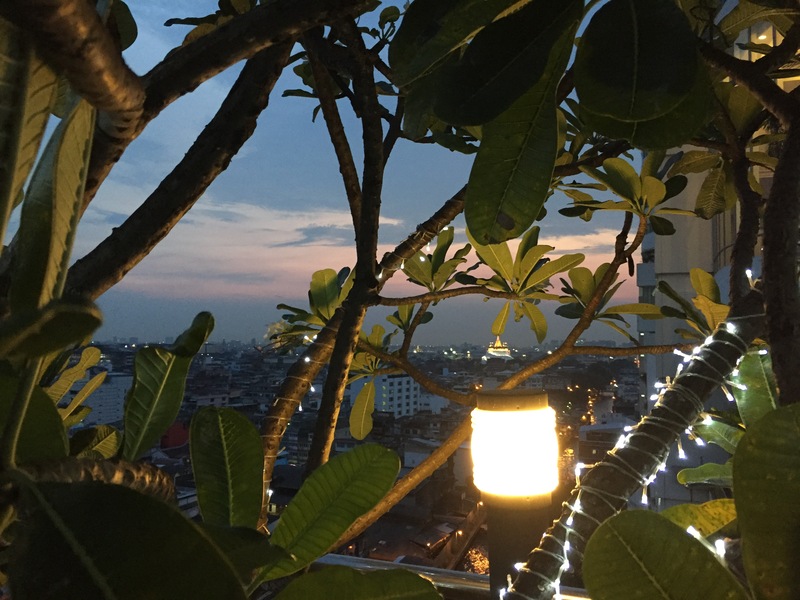 Khao San Road is a sweet place to be, from people that drink and have fun on the streets, to bars that play live music and massage parlors that you can visit either inside, our outside on the street in a comfortable chair while you drink a beer. This evening I decided not to bring any photograph material as my short pants has pockets that are just not quite deep enough to make me feel secure for my belongings. The following day we did a small ‘Mall tour’ as a free day activity, which is a nice option because air-conditioning is a life-saver in warm countries. The malls are in one word, HUGE. If you think you finished everything, there is a cross-way to another mall which has different stores. And after you finished that one? You guessed it, another mall that you can enter through a bridge like way. To make the story short, I ended up walking more than 10km these malls along this day. I got tired at the end of the evening and decided to sleep, to conserve energy for the next day which was an early rise. and stop four was a temple. 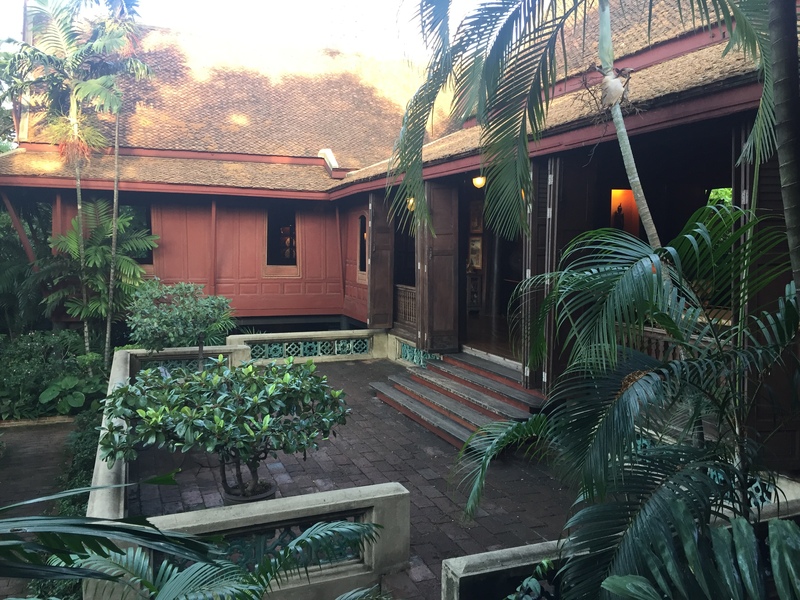 After which I decided I had enough temples for the day and continued my journey to Jim Thompson house, an interesting type of museum that gave a good insight about an American that came to live in Bangkok after the Second World War. I will not go into detail and spoil the surprises of this location, but all I can say, his house is simply stunning, I would want one of these when I grow older. 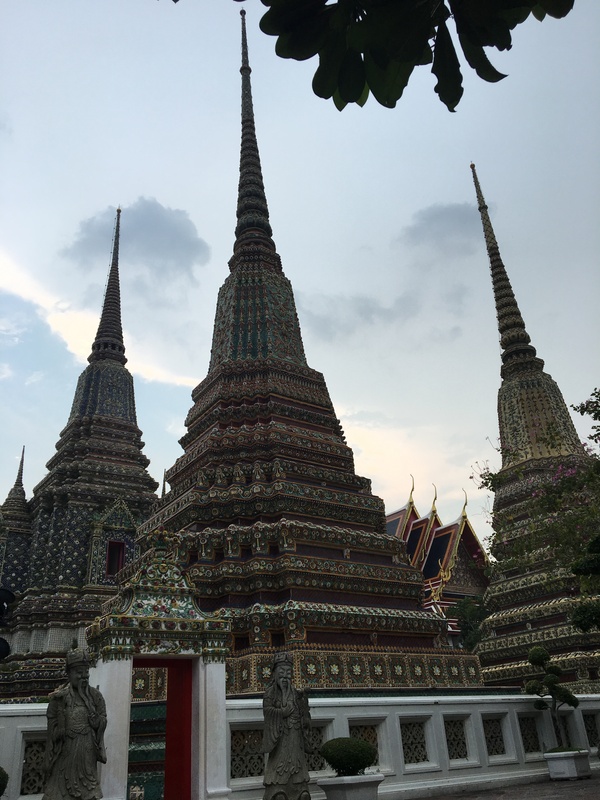 The next day the list consisted of the Golden palace, Wat Pho and Wat Arun. 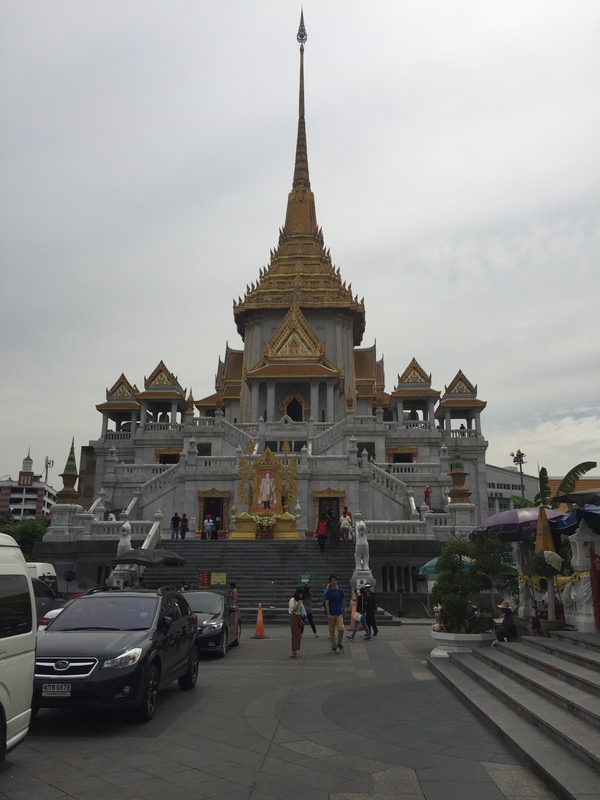 The driver took us to the Golden Palace, which is an immense ground with beautiful buildings covered in gold and other shiny materials. However the warmth stays inside the compound due to the stones on the ground, everyone was sweating. I’ll give you a tip; bring enough water, and an umbrella to escape the sun. Without any prior knowledge, I noticed many Thai wearing black, and then I remembered, it was the coronation day of the King that passed away. 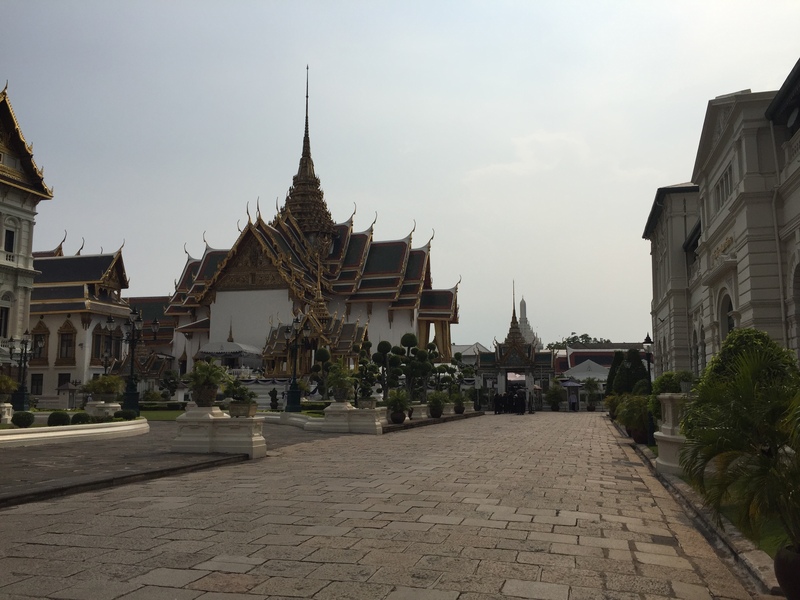 Many people came to pay their respect, which was a nice sight to behold, but unfortunately, many buildings were closed and I could not find the emerald Buddha as the stream of people and the heat made me lose my way, and all of a sudden I was outside the compound. 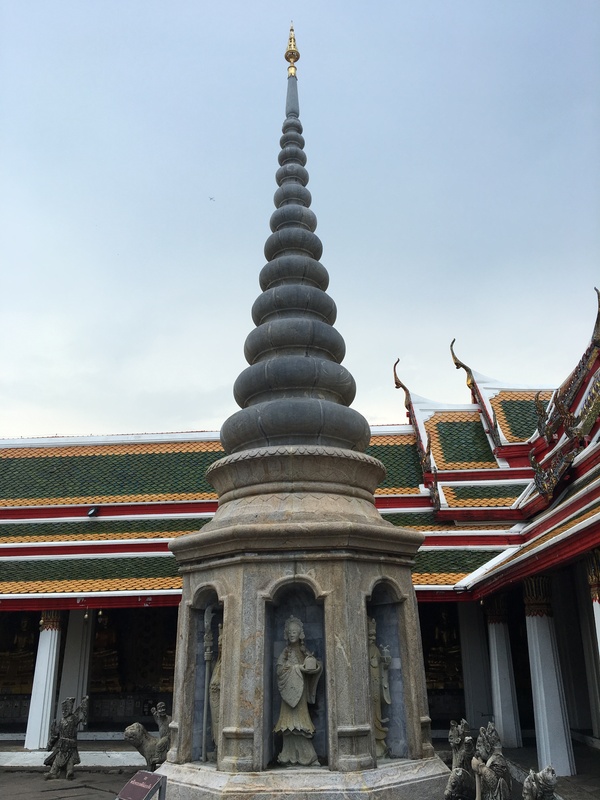 With the ticket being just one-way, I could not re-enter to visit the emerald Buddha, so my tip here, go with a guide who knows where everything is. 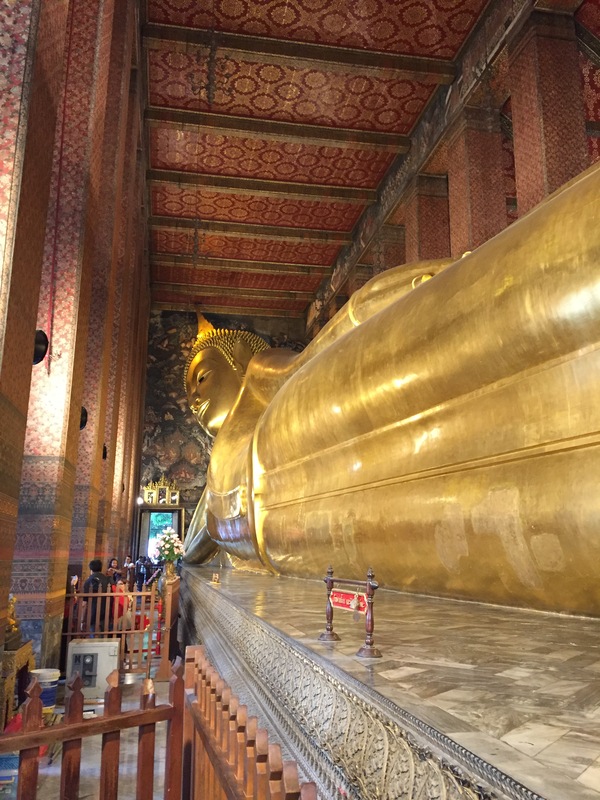 Next on my list was Wat Pho, a stunning temple that houses the reclining Buddha. The grounds of this temple was huge and magnificent, the amount of work that was put into these buildings is breathtaking and I definitely recommend going here, especially since the entrance ticket gives you free water! This place is close to the river that separates Bangkok, which we had to cross to make our way to Wat Arun. We took a ferry which takes you straight across the river and really close to the temple. Once arrived and after enjoying an ice-cream, I made my way to Wat Arun, where I witnessed an unfortunate event; they were renovating or renewing the complex, you could enter, but the pictures and the way up on the temple were minimal, as halfway on the stairs there was a no-entry sign that obstructed by panorama view, so sadly I might have to return here one day. Near Wat Arun however, there is another temple that has many small statues circling the complex that houses a Buddha, which was a nice change from the giganticness of all the other locations I had been that day. This also marked the end of my day so I returned by ferry close to my hotel. The next day it was time to return back to Vietnam and continue work. 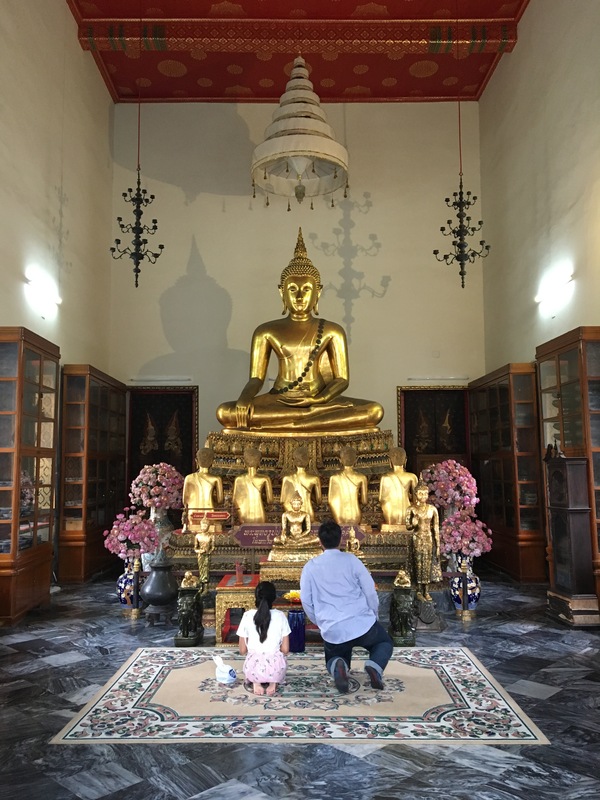 Bangkok is a huge city that requires a little bit more than 4 days, you can see all the highlights, but not the hidden gems that are definitely present in this massive city.